The Pentagon just can’t let go. In the wake of the Charleston Massacre, Amazon and Walmart have announced that they will no longer sell Confederate flag merchandise. Ebay says it will stop offering Confederate items for electronic auction. Mississippi’s Republican speaker of the house calls his state flag, which includes the Stars and Bars in the top left corner, “a point of offense that needs to be removed.” Even Kentucky’s Mitch McConnell, the majority leader of the US Senate, agrees that a statue of Confederate President Jefferson Davis in his state’s capitol building belongs in a museum. It was a reconciled Army that moved out into the world after the Civil War, an unstoppable combination of Northern law (bureaucratic command and control, industrial might, and technology) and Southern spirit (an “exaltation of military ideals and virtues,” including valor, duty, and honor). Both law and spirit had their dark sides leading to horrors committed because of either the very nature of the American empire—the genocide of Native Americans, for example, or the war in Southeast Asia—or the particular passions of some of its soldiers. And both law and spirit had their own flags. After the surrender at Appomattox, it was too soon to fly the Stars and Bars against Native Americans. And it was Union officers—men like generals George Armstrong Custer and Philip Sheridan—who committed most of the atrocities against indigenous peoples. But Confederate veterans and their sons used the pacification of the West as a readmission program into the US Army. The career of Luther Hare, a Texas son of a Confederate captain, is illustrative. He barely survived Custer’s campaign against the Sioux. Cornered in a skirmish that preceded Little Big Horn, Hare “opened fire and let out a rebel yell” before escaping. He then went on to fight Native Americans in Montana, Texas, the Pacific Northwest, and Arizona, where he put down the “last of the renegade Apaches,” before being sent to the Philippines as a colonel. There, he led a detachment of Texans against the Spanish. With Reconstruction over and Jim Crow segregation installed in every Southern State, the Spanish-American War of 1898, in which the United States took Cuba and Puerto Rico in the Caribbean and the Philippines and Guam in the Pacific, was a key moment in the rehabilitation of the Confederacy. Earlier, when slavery was still a going concern, Southerners had yearned to separate Cuba from Spain and turn it into a slave state. Now, conquering the island served a different purpose: a chance to prove their patriotism and reconcile with the North. World War I brought more goodwill. In June 1916, as Woodrow Wilson began to push through Congress a remarkable set of laws militarizing the country, including the expansion of the Army and National Guard (and an authorization to place the former under federal authority), the construction of nitrate plants for munitions production, and the funding of military research and development, Confederate veterans descended on Washington, DC, to show their support for the coming war in Europe. Wilson won reelection in 1916, his campaign running on the slogan, “He kept us out of war.” But he could then betray his anti-war supporters knowing that a rising political coalition—made up, in part, of men looking to redeem a lost war by finding new wars to fight—had his back. Decades before President Richard Nixon bet his reelection on winning the Dixiecrat vote, Wilson worked out his own Southern Strategy. Even as he was moving the nation to war, Wilson re-segregated Washington and purged African-Americans from federal jobs. And it was Wilson who started the presidential tradition of laying a Memorial Day wreath at Arlington Cemetery’s Confederate War Memorial. American history was fast turning into an endless parade of war, and the sectional reconciliation that went with it meant that throughout the first half of the 20th century the “conquered banner” could fly pretty much anywhere with little other than positive comment. In World War II, for instance, after a two-month battle for the island of Okinawa, the first flag Marines raised upon taking the headquarters of the Japanese Imperial Army was the Confederate one. It had been carried into battle in the helmet of a captain from South Carolina. As it happened, it wasn’t. 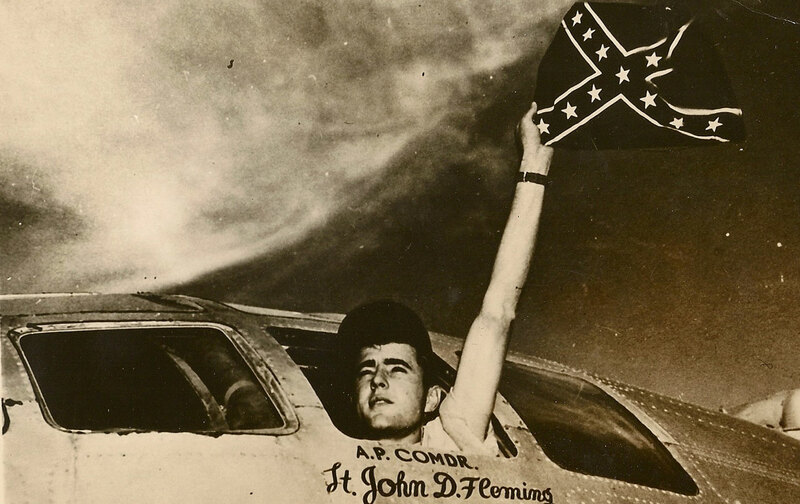 As the civil-rights movement evolved and the Black Power movement emerged, as Korea gave way to Vietnam, the Confederate flag returned to its original meaning: the bunting of resentful white supremacy. Dixie found itself in Danang. “We are fighting and dying in a war that is not very popular in the first place,” Lieutenant Eddie Kitchen, a 33-year-old African-American stationed in Vietnam, wrote to his mother in Chicago in late February 1968, “and we still have some people who are still fighting the Civil War.” Kitchen, who had been in the military since 1955, reported a rapid proliferation of Confederate flags, mounted on jeeps and flying over some bases. “The Negroes here are afraid and cannot do anything,” Kitchen added. Two weeks later he was dead, officially listed as “killed in action.” His mother believed that he had been murdered by white soldiers in retaliation for objecting to the flag. For many, the Confederate flag remained an emblem of racist reaction to federal efforts to advance equal rights and integration. Yet as issues of race, militarism, and class resentment merged into a broader “cultural war,” some in the rising New Right rallied around the Stars and Bars to avenge not the South but South Vietnam. In 1973, shortly after the United States officially ended combat operations in South Vietnam, for instance, Bart Bonner, a conservative activist and Vietnam veteran from Waterbury, New York, met with South Vietnam’s military attaché in Washington and offered to raise “a private, volunteer force of 75,000 American veterans to fight in South Vietnam under the Confederate flag.” For Bonner, and many like him, that flag now stood not for the “lost cause” but all lost causes conservatives cared about, an icon of resistance to the liberal Establishment. Nothing came of Bonner’s plan. But the scheme did anticipate many of the strategies the New Right would use to circumvent all those cumbersome restrictions the post-Vietnam Congress placed on the ability of the executive branch to wage war and conduct covert operations, including the rise of mercenary groups that continue to play a significant role in fighting America’s wars and attempts to raise money from private, often Southern right-wing sources. Ross Perot, for instance, would fund some of Oliver North’s effort to run a foreign policy independent of congressional oversight, a scandal that would become known as Iran/Contra. The infamous March 1968 massacre at My Lai would prove especially useful in helping Nixon win the moonlight-and-magnolia set. After it came to light that members of the 23rd Infantry Division, also known as the Americal, had slaughtered more than 500 Vietnamese civilians, including women, children, and infants, Nixon made his support for Lieutenant William Calley, the only soldier convicted for taking part in the massacre, a key element in his reelection campaign. As historian Joseph Fry points out in his new book, The American South and the Vietnam War, Calley, who was from Florida, was extremely popular in the South. George Wallace, the segregationist governor of Alabama, flew to Fort Benning, where Calley was being held under house arrest, to speak at a rally replete with Confederate flags. Mississippi Governor John Bell Williams told Nixon’s vice president, Spiro Agnew, that his state was “about ready to secede from the union” over Calley.